Teuvo Teravainen is a player that many hockey collectors were eyeing over his rookie season, but his breakout in the playoffs means he is no longer flying under the radar. The dynamic Finnish center has collectors and fans of the Chicago Blackhawks very excited about the future and his rookie cards are trending up. 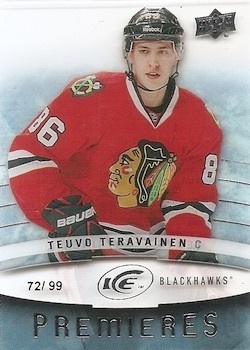 Shop for Teuvo Teravainen cards on eBay. Drafted 18th overall by the Chicago Blackhawks in the first round of the 2012 NHL Draft, Teuvo Teravainen spent the next two seasons with Jokerit before making the move to the NHL. He played three games with the Blackhawks near the end of the 2013-14 season before beginning a stint with the Rockford IceHogs of the AHL. Teravainen rejoined the Blackhawks in the second half of the 2014-15 season and put forth a decent end to the regular season. However, his breakout came in the 2014-15 playoffs. Playing with a veteran poise, Teravainen helped the Blackhawks claim several wins and has the team on the path to another Stanley Cup title. 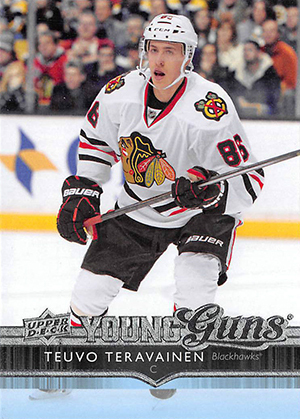 Despite his late addition to the NHL roster, Teuvo Teravainen already has a good mix of rookie card options. In addition to several low-end and mid-range options, the key cards are any of his signed rookies, as well as his Ice Premieres and SP Game Used base rookies. Both of these unsigned rookie cards feature a print run under 100 copies and have proven quite popular. Although the print run is slightly higher, the acetate Ice Premieres is the preferred option of those two cards. Based on his potential, quick progress and his role on a high-profile team like the Chicago Blackhawks, Teuvo Teravainen is young player that could one day be viewed among the hobby elite. He still has a long way to go, but the collecting world has certainly taken notice. The following checklist includes all the official rookie cards for Teuvo Teravainen. The guide will be updated with more rookie cards when additional 2014-15 NHL products are released. Scott � Those are all great card options, but this guide only covers official rookie cards and the cards you referenced are all considered inserts. Scott � It really boils down to the cards that are numbered as part of the base set. Any inserts for a rookie player are still viewed highly, but the official rookies are the cards that are directly attached to the base set. That is why cards in the The Cup are still considered official rookie card. Obviously most of the rookie-year cards are popular, regardless if they are “official” or not, and not everyone looks at the RC designation the same way.